VERY HARD TO FIND NOW DUE TO HIGH DEMAND!
. Built in framelines for 21/25/28/35/50 mm lenses. WITH Voigtlander case. For 99% of all Leica M mount lenses, or Leica Screw Mount lenses with M adapter. the ONLY full frame AE exposure M mount rangefinder camera EVER made with 21/25 framelines! Introduced at Photokina in October 2006, the Voigtlander R4M and R4A are the ONLY production 35mm rangefinder cameras EVER made with built in parallax projected framelines for 21, 25, 28, 35, and 50mm lenses. This is a REALLY BIG DEAL for rangefinder lovers who have long dreamt of a RF with built in 21 and 25 framelines, but were always told it was IMPOSSIBLE! 2013 Update: The R4A is discontinued, but still in stock. The R4M is still in production. 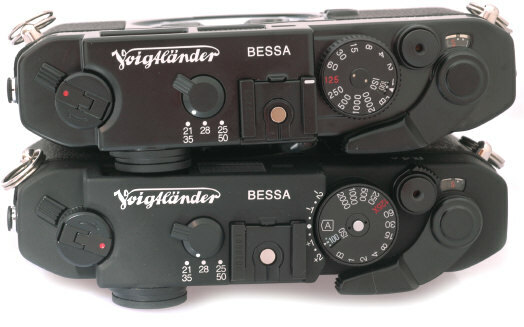 Bessa R4M and R4A, can you tell which is which? What are the differences? I have the R4M and have had the pleasure of using it for the last two weeks ( with the new 21/4P - the 21/4 in M-mount). There are some cameras that are "moments of truth" in a photographers life. the first time I held an m2 with the 35 on it, my first Nikon F and the Leica MP with the 0,58 finder. The R4 falls into this category! If you are a wide-angle shooter, it is an "epiphany" camera. It just fits in your hand and view. For the trip to Japan I took a M2 with the VC 40/1,4 MC, a R3M with the 75/2 Summicron and as I knew that I would get the R4M and the new 21/4P once I got there, it was an unusually light travel pack for me. I did include a 12/5,6 for a specific shot (the shattered dome at Hiroshima Peace Park). Of the 45+ rolls I shot, about 25 were shot with the R4M. It is a spectacular finder! With the 21 I can see the framelines with glasses on. There is a faint reflection of the frames off to the side of the finder but not disturbingly so. Shutter noise and feel is the same as on any R3/R4 body. 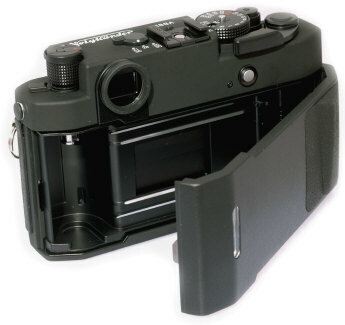 Slightly "clunky" release, which is a function of the shutter. Advance is very smooth and rewind better than on my Zeiss Ikon? All of this pales when looking through the finder - it is crisp, clear and sooo wide! So far I have only been using it with the 21/4P ( Mt kobayashi said, when he gave it to me" Oh, I hope you don't mind that it is a pre-production lens! The full production run wont start until next week!". No. I did not mind at all! It is the same formula as the screw-mount version and as that is one of the best 21's that you can buy - why change. The aperture ring has the "ears" of the 35/2,5 II on it and it makes it easy to set and change aperture. The R4 finder is a very complex piece of work! It is not just a lower magnification finder with some wide frame lines stuck in it. In Rf designs it is a first of its kind and it took almost three years to develop. It is obviously designed for the wide angle user - the 50 finder is small and "peepholish" and is more of an 'emergency" finder. If you are a shooter who primarily uses 35/40/50/ and longer lenses it is not for you. I am wide-angle shooter and the 35 is my normal and the 50 I treat as a short tele! The R4 is a dream come through - no more top-mount finders to loose or snag in straps and a faster frame/focus than with these finders. I have found that my "hit" rate (keepers) with 21/25 lenses has vastly increased with the R4. Shifting from one finder for focus to another for framing breaks the concentration while shooting and with the R4 i dont have that problem. The frame-lines are straight and clearly defined though the 21 lines are right at the edge of vision with glasses, but no more so than the 40 lines on the R3 or the 28 lines of a 0,72 Leica M2. I am considering the R4 as a "mile-stone" camera, right up there with the first M3/M2's with the bayonet lens-mount and the Nikon F. I have had mine since mid-March and so far I have never ventured outside without it! I usually match it with a M2 or R3 (and the 40/1,4). For those of you who are waiting for your R4's - it is worth it and for those of you who are wavering - if you like using 21/25/28 and even 35's - just go for it! Previously the widest frameline ever built into a Leica M mount film camera was 28mm. The new Bessa R4M / R4A cameras open up a new world of convenient possibilities to the dedicated RF user. The minds behind the revolutionary wide angle Voigtlander R4M and R4A are Cosina's CEO Mr. Kobayashi, and his good friends Tom and Tuulikki Abrahamsson of Rapidwinder.com. 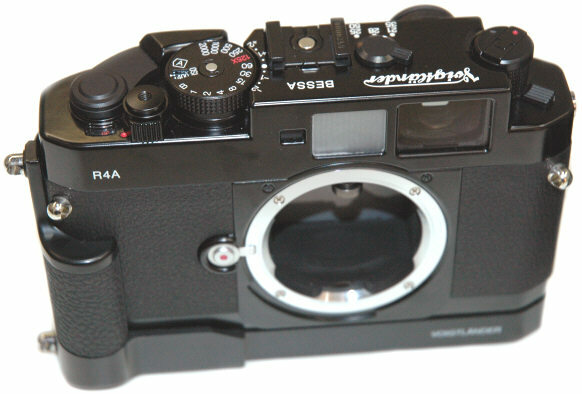 Tom first asked Mr. K for a super wide Bessa about five years ago. Once again Mr. K has brought to marketplace a unique rangefinder design never before offered. In practical terms the new R4M / R4A viewfinders mean 35mm photogs will not have to carry and keep track of 21 and 25 accessory viewfinders. For the first time photogs will be able to view and focus the 21 and 25 lenses from the SAME viewfinder without having to move their eye to a separate 21 or 25 viewfinder. This translates perfectly to having a Bessa R4M/A wide for 21-35 lenses, plus a Voigtlander R3A/M body with 1:1 viewfinder for the 40/50/75/90 lenses. The new R4 series offer a combined rangefinder/viewfinder at .52x magnification with user selectable 21/35, 28, and 25/50 parallax corrected brightline frameline combinations. These are high eye point viewfinders, making the even the 21 frameline easily visible by most glasses wearers. Shown above are prototypes displayed behind the scenes at Photokina 2006. The R4M above is # 00001. Production R4M cameras will be available in the classic black paint finish above. 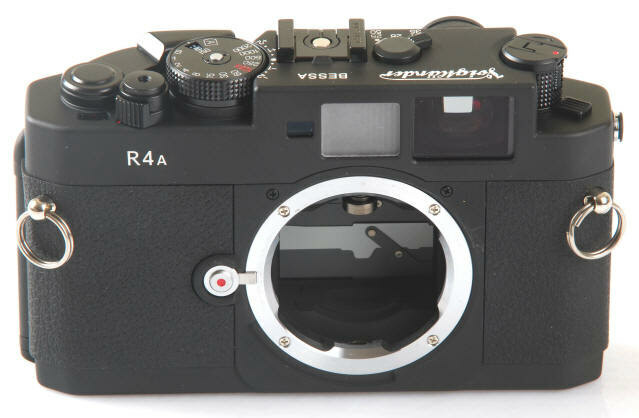 Production R4A cameras will only be available in a matte black paint, which looks much like Leica's black chrome finish. Other than the viewfinders, features and operations are the same as the previous R3M and R3A. 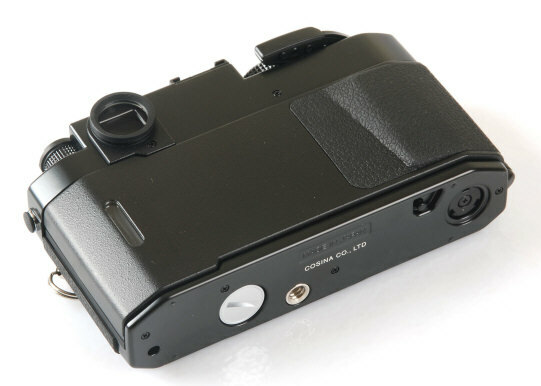 The R4M is a mechanical shutter camera which works without batteries. It has a LED metering display along the bottom of the viewfinder, displaying exposure information in .5 EV values. The metering display is like the R3M. The R4M is available only in classic black paint finish., like the R2M or R3M. The R4A is an electronic shutter camera which offers metered manual or aperture priority exposure. Like most other electronic shutter cameras, dead batteries mean a dead camera. The metering display is like the R3A. The R4A is available only in matt black finish. Notice the R4A's Exposure AE lock on the back of the top plate, and the A for Aperture Priority Exposure on the shutter speed dial. 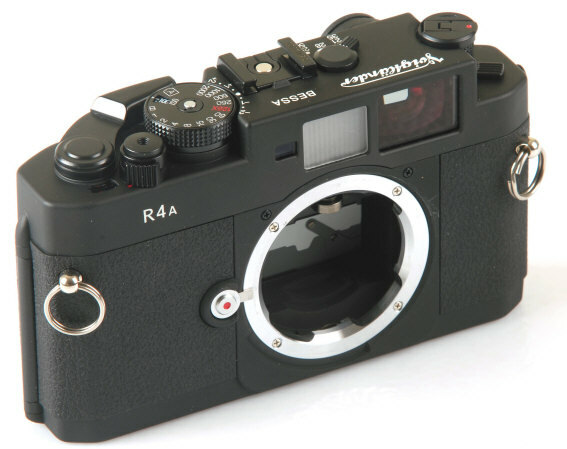 The R4A has a matt black finish. The R4M has a classic black paint finish. 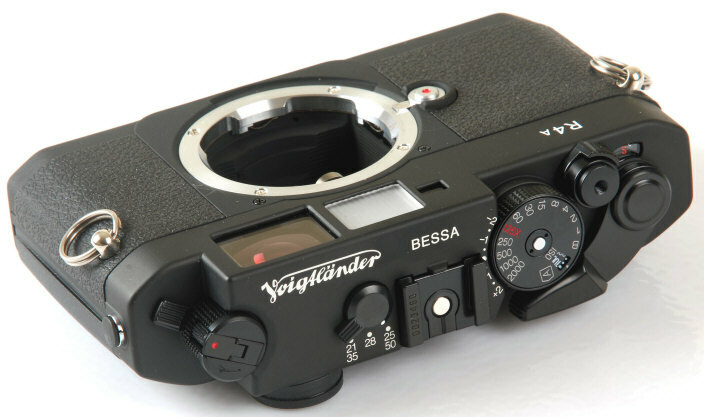 All the Voigtlander Bessas have fast easy to load back door film loading, along with a film window to remind you if you have film in the camera.